This year’s annual Black History Month lecture brings two Philadelphia Inquirer journalists to the Library to discuss Civil War history. Daniel R. Biddle and Murray Dubin, co-authors of Tasting Freedom: Octavius Catto and the Battle for Equality in Civil War America, will speak in the first floor lounge on Wednesday, Feb. 23, at 4:30 p.m. This event, presented by Africana Studies and co-sponsored by the history department and the Library, is free and open to the public. 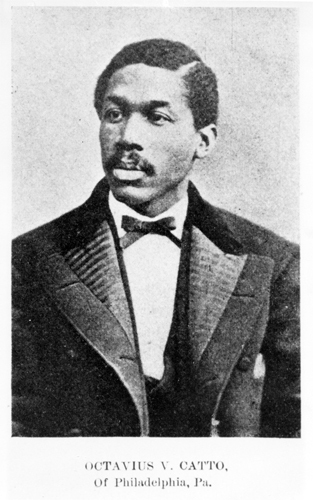 Octavius Catto was an educator, Civil War activist and well-known baseball player in 19th century Philadelphia. He attended the Institute for Colored Youth, which would later become Cheyney University. At the age of 20, he returned to the school as a teacher and became known for his excellent oratorical skills. Tasting Freedom provides an in-depth look both at Catto’s life and the history of the fight for black rights in America. Library Journal calls it a “captivating story” that “illustrates the too often neglected street battles for black rights in northern cities long before the hot summers of the 1960s” (starred review). Biddle and Dubin have recorded a video interview that provides a great introduction to Tasting Freedom and the upcoming lecture. Extensive excerpts of the book are available to read for free at their website.